Here you see two cakes, one round, and one oblong shape. One cake for my monthly Daring Baker challenge, and one for the people who were born in August! Million thanks to our host Chris from Great Cakes by Carol Walter as this month’s DB challenge! I absolutely adore it! - Day #1: Make all the components and set aside. - Day #2: Assemble the cakes and let them chill in the fridge. - Day #3: Decorate & garnish the cakes. The most challenging part was deciding how to decorate the cakes. Since I know nothing about the art of piping on cake like the master Carol Walter, I emphasized more on playing up the flavor of the cake! For the round, mini cake, I topped it with a little bit of praline buttercream (sprinkle with praline paste), some caramelize hazelnuts and a caramel sugar design. Since the side of the cake turned out rather bumpy, I covered with vanilla macarons. 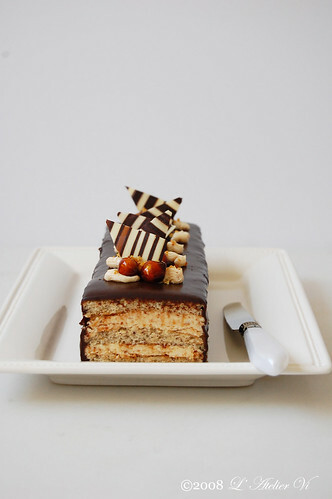 As for the oblong cake, I put tempered chocolate triangles instead of caramel sugar design, caramelize hazelnuts and praline buttercream. It just screams hazelnuts! Fun facts: Filberts = hazelnuts?! Why are hazelnuts called filberts? • Recipe ingredient exception allowed if allergy or an ingredient is not available or cost prohibitive in your region. Otherwise, the recipe does need to have nut of some sort! You can use another nut, should you prefer, but carry it throughout. If allergic/too costly, please refer to the Alternative bakers for assistance. • You may use a buttercream or whipped cream filling under the ganache. But, make sure you cite your source. Whatever you choose, the end result must be praline. • Buttercream garnish/decoration can be however you choose, but it should be on the cake in some form. 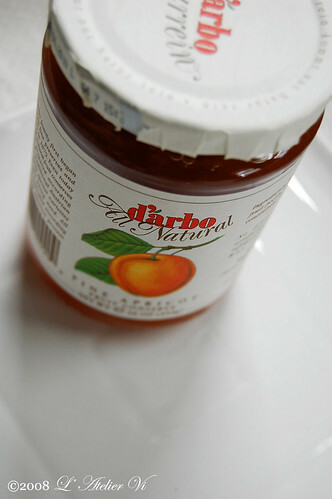 • The glaze – you don’t need to use apricot flavor, use whatever flavor you prefer e.g. orange or raspberry. Fresh fruit is okay for the garnish only. • If the indicated pan size is not available, use whatever round size you prefer, just know you may need to make adjustments, accordingly. This means you may halve (not 1/3) the recipe, or make mini-cakes but no cupcakes and it must be round! - Position rack in the lower 3rd of the oven and preheat to 350/180 degrees. - Grease and flour a 10” X 2” inch round cake pan. Using a food processor, processes nuts, cake flour, and cornstarch for about 30 seconds then pulse the mixture about 10 times to get a fine, powdery mixture. You’ll know the nuts are ready when they begin to gather together around the sides of the bowl. While you want to make sure there aren’t any large pieces, don’t over-process. Set aside. Tap the pan on the counter to remove air bubbles and bake in the preheated oven for 30-35 minutes. You’ll know the cake is done when it is springy to the touch and it separates itself from the side of the pan. Remove from oven and allow it to stand for 5 minutes. Invert onto a cake rack sprayed with nonstick coating, removing the pan. Cool the cake completely. Place the egg whites in a large bowl of an electric mixer and beat with the whisk attachment until the whites are foamy and they begin to thicken (just before the soft peak stage). Set the bowl over a saucepan filled with about 2 inches of simmering water, making sure the bowl is not touching the water. Then, whisk in the sugar by adding 1-2 tablespoon of sugar at a time, about 1-2 minute for this step. Continue beating 2-3 minutes or until the whites are warm (about 120 degrees) and the sugar is dissolved. The mixture should look thick and like whipped marshmallows. Remove from pan and with a whisk attachment, beat the egg whites and sugar on med-high until its a thick, cool meringue – about 5-7 minutes (*Do not overbeat*). Set aside. Place the butter in a separate clean mixing bowl and, using the paddle attachment, cream the butter at medium speed for 40-60 seconds, or until smooth and creamy. *Do not overbeat or the butter will become too soft*! On med-low speed, blend the meringue into the butter, about 1-2 Tbsp. at a time, over 1 minute. Add the liqueur and vanilla and mix for 30-45 seconds longer, until thick and creamy. Refrigerate 10-15 minutes before using. Refrigerate in an airtight container for up to 5 days, or can be frozen for up to 6 months. If freezing, store in 2 16-oz. plastic containers and thaw in the refrigerator overnight or at room temperature for several hours. 1. Wait! My buttercream won’t come together! Reheat the buttercream briefly over simmering water for about 5 seconds, stirring with a wooden spoon. Be careful and do not overbeat. The mixture will look broken with some liquid at the bottom of the bowl. Return the bowl to the mixer and whip on medium speed just until the cream comes back together. Line a jelly roll pan with parchment and lightly butter. Set aside. Put the sugar in a heavy 10-inch skillet. Heat on low flame until sugar melts around the edges. Do not stir the sugar. Swirl the pan if necessary to prevent the melted sugar from burning. Brush the sides of the pan with water to remove sugar crystals. If the sugar in the center does not melt, stir briefly. 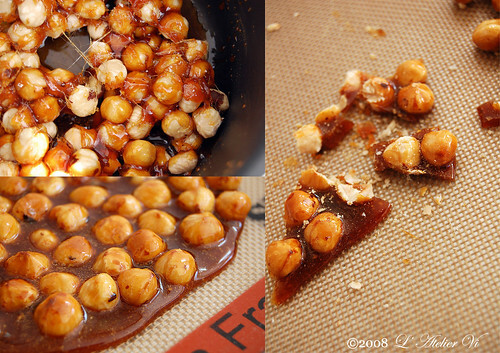 When the sugar is completely melted and caramel in color, remove from heat; this process can take 5-15 minutes. Stir in the nuts with a wooden spoon, toss, and separate the clusters. Return to low heat and stir to coat the nuts on all sides, meanwhile use the wooden to separate the clusters. Cook until the mixture starts to bubble (**Handle with care – extremely hot mixture**), then pour onto the parchment lined sheet and spread as evenly as possible. As it cools, it will harden into brittle. To make paste, just break the candied nuts into pieces and place them in the food processor, process for several minutes until the brittle turns into a powder. Do not refrigerate! Store in an airtight container and store in a cool dry place. Blend ½ cup buttercream into the paste, and then add to the remaining buttercream. Whip briefly on med-low speed to combine. Blend in rum. Makes 1 cup, good for one 10-inch cake and can be made in advance. Bring the water and preserves to a slow boil in a small heavy saucepan. Simmer for 2-3 minutes. If the mixture begins to stick to the bottom of the saucepan, add water as needed. Remove from heat. Using a strainer, press the mixture through the mesh and discard any remnants. With a pastry brush, apply the glaze onto the cake while the cake is still warm. If the glaze is too thick, thin to a preferred consistency with drops of water. Blend vanilla extract and liqueur together and set aside. Break the chocolate into 1-inch pieces and place in the basket of a food processor and pulse until finely chopped. Transfer into a medium sized bowl and set aside. Heat the cream and corn syrup in a saucepan, on low, until it reached a gentle boil. Once to the gently boil, immediately and carefully pour over the chocolate. Leave it alone for one minute, then slowly stir and mix the chocolate and cream together until the chocolate is melted and incorporated into the cream. Carefully blend in vanilla mixture. If the surface seems oily, add ½ - 1 tsp hot water. The glaze will thicken, but should still be pour-a-ble. If it doesn’t thicken, let it sit for about 5 minutes. Cut a cardboard disk slightly smaller than the cake. Divide the cake into 3 layers and place the first layer top-side down on the disk. Measure out 1 cup of praline buttercream and set aside. Using a pastry brush, moisten the layer with warm sugar syrup. Spread the bottom layer with a ¼-inch thickness buttercream, leaving ¼-inch border around the edge of the cake. Place the middle layer over the first, brush with sugar syrup, and spreading with buttercream. Moisten the cut side of the 3rd layer with sugar syrup and place cut side down on the cake. Gently, press the sides of the cake to align the layers then refrigerate to chill for at least 30 minutes. Lift the cake by sliding your palm under the cardboard. Trim the top layer to a slight slant angle so to help the ganache drip over the edge. Brush the top and sides of the cake with warm apricot glaze, sealing the cut areas completely. Chill while you prepare the ganache. 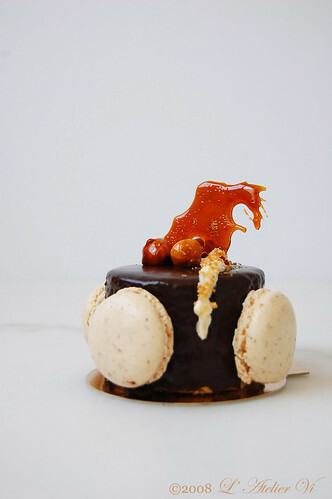 Fill a piping bag with the reserved praline cream, and get creative! If you want, sprinkle some chopped filbert garnish (nut meal) on the cake. Refrigerate uncovered for 3-4 hours to allow the cake to set. Remove the cake from the refrigerator at least 3 hours before serving. Leftover cake can be covered with foil and kept in the refrigerator for up to 5 days. Wow, extremely pretty! Those cakes look terribly good and ever so perfect! I can't decide which one I like better but both versions are gorgeous and your decorations are impressive! Wonderful job, so professional! I really love the look, bet they taste great too! So you are our artist! Very, very beautiful! Vi, your cakes are both elegant! Love the simple yet sophisticated decor. Your cakes are so perfect! They look so delicious!!! Both cakes are lovely, and your ganache glaze came out so smoothly! So far, one of the most beautiful creation of this challenge! Pure, elegant, smooth! Truly beautiful, congratulations! Love the praline decoration. Wow - I'm impressed! Great job! Stunning designs, and love your photography! gorgeous!!! 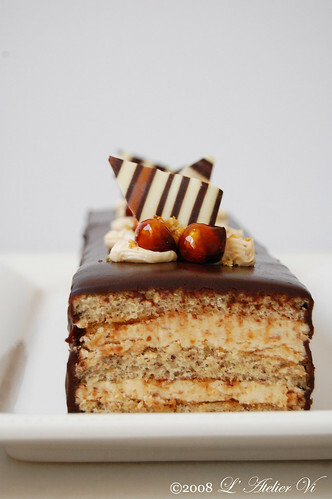 it's a whole new take on the opera cake as well as the filbert gateau! really really lovely. i'm impressed! Just awesome! I'm speechless! So elegant and artistic! What beautiful little cakes. I love that you made two different shapes out of the cake batter! Great presentation! I love it :) Good job! It is perfect, j'en mangerais dès maintenant, so wonderful, and your photos are amazing!! Stunning! I'm speechless! The toppings are beautiful. Very pretty! Love both cakes! Mind-blowingly terrific cakes! Very creative! 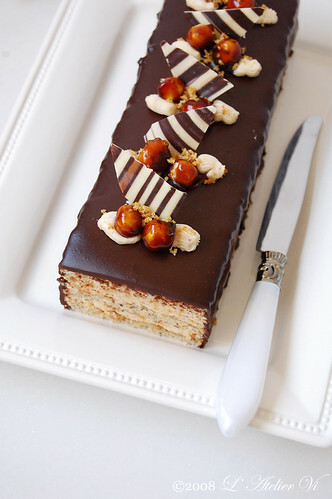 I absolutely love the look of your oblong cake! Beautiful! Lovely as always . . . . . . .
What a beautiful cakes! Absolutely gorgeous, and different! btw, your cake looks goooooorrrrgeous! what a beautiful looking cake. Every min of effort is worth it frm the looks of it. The ingredients n assembling instructions looks amazingly tedious. 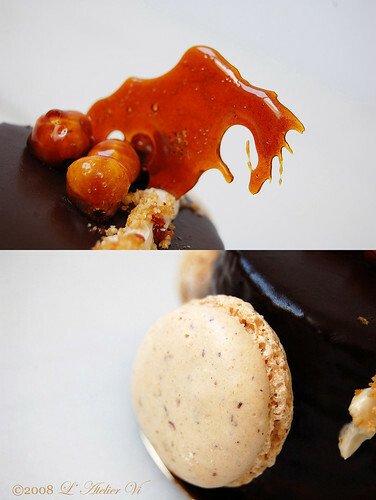 Just found your blog ... both these creations look absolutely divine. I'd find it hard not finish them all in one go. Great job. I'm in love with both your cakes! How elegant! Your cakes are gorgeous! You are so talented! Thank you for your visit to my site! Stop by to visit anytime! Your cakes look lik they are right out of Gourmet Magazine! PERFECT! 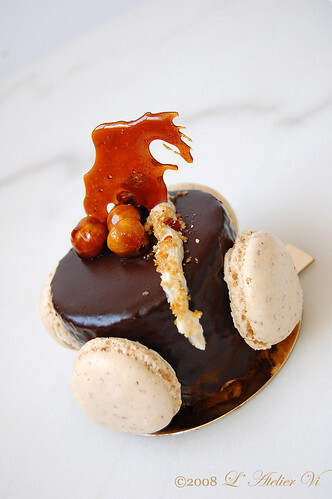 I love the macaroons around the small cakes. You have such beautiful photos! what a perfect little cake! There is a Uniglo in NY.. in Soho.. it's huge! Ooo, your cakes look amazing! I love all of your designs/decorations! Both of your cakes are absolutely gorgeous!! You are very talented! It's so unfortunate that my English vocabs are quite limited and I often find a lack of words to describe your beautiful cakes. =_="
They are... beautiful and beyond beautiful! as usual. Is this who I think it is??! I am glad to see you here! Don't forget to show me your masterpiece when you're done!